The government of Ghana says it has indicated to the United States government its strongest abhorrence of inhumane treatment Ghanaians who are deported from the United State of America. 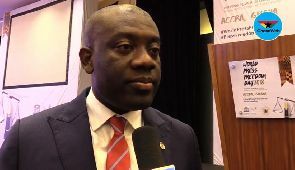 Addressing the press Tuesday in Accra, Deputy Information Minister, Kojo Oppong Nkrumah, said government had taken note of the concerns of Ghanaians regarding the inhumane treatment Ghanaians who are deported from the United States of America. “We have told the United States government, that the government and people of Ghana will no longer countenance such acts from the United States government,” he said. The minister assured Ghanaians that government will act in all times to protect the rights and dignity of Ghanaians. It will be recalled that 86 Ghanaians were deported from the United States in march. The deportees were arrested at different states for various immigration offences such abuse of the terms of their visas and engaging in illegal employment. Many of them were detained for periods ranging from between six and 12 months before being deported to Ghana.